APP’s ProTek Package combines three of our corrosion preventing solutions in order to completely isolate your pipe from any metal-to-metal contact. This grouping of products allows pipe movement to occur seamlessly without causing any abrasion issues. It was originally developed for use in demanding offshore environments where the cost of maintenance and repair can easily exceed millions over the lifespan of the facility. The ProTek Package minimizes the need for costly inspections and pipe repairs, which is why it is now being used by customers everywhere who care strongly about the total cost of ownership. Protects the top of the pipe from abrasion that would be experienced with a traditional metal u-bolt caused by pipe movement. Protects the bottom of the pipe from corrosion by acting as a barrier between the pipe and the support structure. 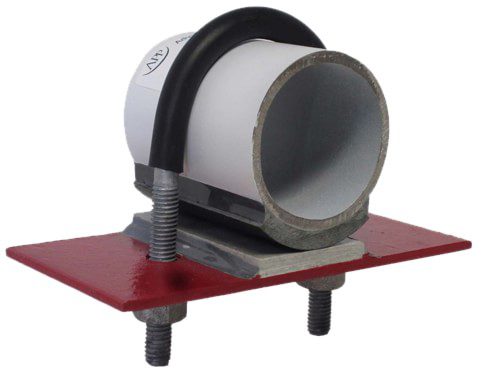 Protects a flat structure, such as an I-beam, from wear due to pipe movement.